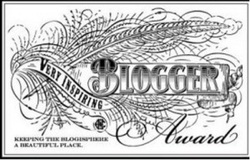 For some strange reason, I have been nominated for a Very Inspiring Blogger Award by the much-more-inspiring-than-me-and-soon-to-be-published-too-so-hurry-over-to-her-blog Sophie E Tallis. Well, Sophie, thank you. I am humbled, as more likely to be awarded Procrastinator of the Year, if anyone ever gets round to it. I understand it's a bit like a chain letter. So here goes. 1. Thank the blogger who nominated you - done that (see above). 2. Share seven things about yourself - done that (see below). 3. Nominate other bloggers you think deserve the award, and post on their blog to let them know they’ve been nominated. Shall do. 1. The first thing about me has to be some kind of health warning. I’m a very boring, dry, serious person. I do a very serious job, doing very serious work for very serious clients on behalf of my very serious bosses. It’s all very serious, stuffy and professional, and so it should be as the stakes invariably are high and the client’s confidence must be maintained. That’s why I do try to keep my frivolous, facetious writerly persona distinct from my day-job’s professional persona. Which is not to say I don’t aspire to the heights of professionalism in my writing. It’s just that my day to day work doesn’t quite mix with magic and such nonsense. Did I mention it’s very serious? 2. I think I may have let this slip from time to time, but I’m half French, which makes watching the Six Nations very difficult. Growing up in France gave me a different introduction to the Fantasy genre, via comic books. I’m sure you’re all familiar with the likes of Asterix and Tintin, but continental comic books go way beyond that. Anything by Moebius (also known as Jean Giraud or Gir) was infused with genius. And La Quete de l’Oiseau du Temps has to be one of the best graphic fantasy sequences out there. I’m still very attuned to comics. 3. Now for something that might be less well known. I’m something of a Formula One nut. I’m just fascinated by the technology, the intrigues and the sheer brilliance of the drivers. It comes from being able to attend the Monaco Grand Prix year after year as a little kid, watching from a balcony just above the first corner. My dad’s company used to hire a flat to entertain guests and employees. Even though I pretend to be a writer, I still struggle to convey the sensation of being stood there as a little boy, watching those veritable missiles screaming up the hill, snaking their way at lightning speed between the Armco barriers up what I know from having walked it, is a narrow, windy and painfully steep lane. My ears always gave up after a couple of laps, and it was the thunder of vibrations through my stomach and through my white-knuckled grip on the balcony railings that told me when they rent the air asunder with their gear changes on their ascent to Casino Square. Those were heady days, indeed. 4. Did I mention cartoons? 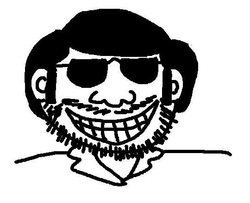 What was it that changed me from drawing cartoons (in French), which I did in vast quantities back then, to writing novels (in English)? The Silmarillion. When I read it, I was far too young to be in any way able to understand the vastness of that epic, but I read it in almost one sitting, one Christmas – it was a present, you see, but so absorbed was I, I cannot remember who gave it – one ghostly Christmas, might I say, as I read it in the one room in my Grandparents’ house where I was not meant to be during that family reunion, my Great-grandmother’s room where she had recently passed away and which was left untouched from that moment on, a room that had a feeling of an older, more ancient England, that had a befogged view over the ancient shipyards of Bideford, like a portal to elder times. Perfect place for transportation to Beleriand. 5. Ah, yes, cartoons. In those days I finished them too. Some of those who read this might be aware of my tendency not to finish things, my slight bent for procrastination. It took me eight years to finish my PhD at Sheffield Uni. Something of a record at the time, I believe. 6. It might therefore surprise none of you, therefore, in the light of the above, to learn that I do not drive. I’ve never tried to learn. No, that’s a lie. My brother gave me a driving lesson, once. And, shortly after the lesson begun, swore vehemently never to offer to do so again. Yes, I know there’s a slight contradiction there with my boyhood ... well continuing ... fascination with very, very fast cars. I’m a complicated person, see? 7. I suppose I can’t avoid the topic of pets. Yes, I have a black rabbit. No, it’s the sweetest, gentlest creature on this earth ... until I turn my back. I’m a through-and-through dog person, really, and so are all my family, but we are far too busy to give a dog the attention it needs and deserves (the plus point with a rabbit is that you can leave it in the yard without fear of disturbing the neighbours – rabbits don’t bark or howl, or only do so very quietly). Once I’ve graduated to being a stay at home writer, I’ll have a dog. It had better be nice to the rabbit. Her thread on Authonomy.com was a precursor to the Alliance of Worldbuilders, for the creation of which Sophie gave me the award above, so it's only fair I should doff my cap. Kate is also exemplary in her level of activity in the blogosphere and beyond. For being Fan No 1 of Darkened Voices, and being the VC of the Alliance. For being Fan No 1 of The Ratter's Tale, and chief goad. "Splinters" now available for purchase. I've just bunged my FFF short stories onto KDP just to see what happens. The book is now "under review" and should become available in a few days. I have uploaded a lightly edited version of "Help me Daddy!" today. Funny how reading on a Kindle rather than on the familiar old PC makes typos and homophones jump out. A couple of minor substantive changes too. New Flash Fiction uploaded: "Safe Haven". Published at last! Well, self published. Well, not even self. Nevertheless, two of my tales (on this webpage) have been published as part of an anthology of tales by members of the Authonomy website. Our good friend Splinker (Adam Sifre in the real world) has pulled together the entries of his Flash Fiction Friday threads and a few others to make a book. The twin challenges were write a horror story for Halloween, but write it in exactly 416 words, no more, no less. Why 416? Well, Authonomy was running another competition with that world length requirement and, Splinker being Splinker, he had to subvert it. The excellent result can be found here. Seriously, there are some excellent stories in there, and not just my ones (to be found at Chapter 20 - The Chair and at Chapter 64 - Giz a light).It's free too. So no excuse. Have a read. Now, that's better. New Twitter feed on the side. Over there. At least there will be a few more updates a bit more often. No promises made about how interesting they might be. Sewing "Like" and "Send" buttons all over the place. Let's see if they work.